The Butler baseball program hosted camps in two sessions last weeks for 55 kids in grades 4-9. 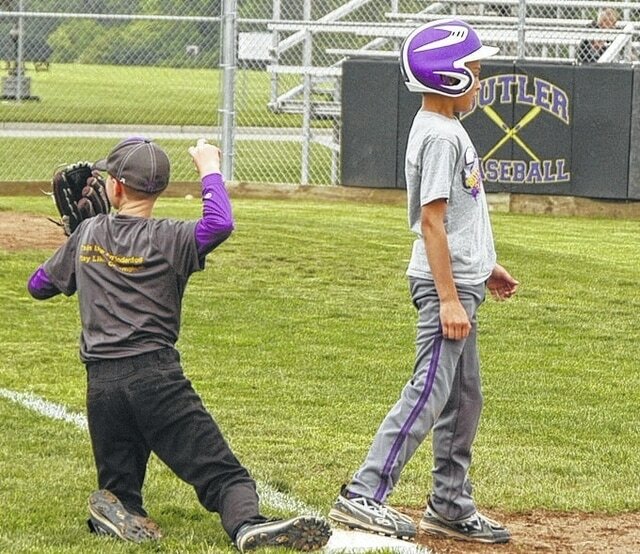 VANDALIA – It’s no secret that success breeds success, and the Butler Aviator baseball program under head coach Trent Dues has developed that reputation over the past 21 years. Last week the Aviators held camps for 55 kids entering grades 4-9 to continue that legacy into the future. Unlike other sports with youth leagues that feed the high school, baseball players play on a multitude of travel teams, little league, and recreation teams before they get to the high school level. Dues and his coaches Mike Bardonaro and Steve Clark know a few things about repeating success. Under Dues, the Aviators have never finished worse than second in league play and have won titles in 16 out of 21 years, including 11 straight from 1996 to 2006. Aviator baseball teams have won 12 sectional titles, eight district titles, and a regional title in 2000. The 2015 Butler Aviators became the first team to go undefeated (10-0) in league play while finishing 22-6 overall.